So, the next thing I am going to explain is how I pan the instruments properly to simulate orchestral placement for each instrument section. This is the chart I reference when panning my instruments. Panning is where all of those stereo tracks from Kontakt (see part 1) will come in handy, because these are all sections of multiple instruments within the orchestra. 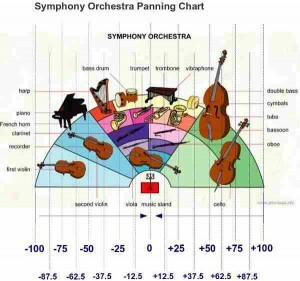 Some people would use mono track for a single section and pan them left or right according to the orchestra sitting chart. That is okay, but what you have to realize that what we’re doing with virtual orchestra is that we’re SIMULATING a live orchestra setup. Those instruments are panned left or right, but their sound travels and expands in multiple directions. That’s why a stereo track is more useful. Usually orchestras are recorded by using multiple microphone positions. For example: The entire orchestra is recorded with a Decca Tree mic setup that’s positioned behind the conductor and is picking up the full orchestra’s sound. In addition, every section of the orchestra has its own stereo mic pair that is positioned very closely to the performers. I use the full string section from Symphobia (e.g. Sustain strings) and layer it with LA Scoring Strings sustain patches. What I like about this approach is that Symphobia has the “room sound” and LA Scoring Strings are very dry, because of their close mic setup. Now, according to the chart above, I ould pan the Symphobia strings from -100 to +100, and individual sections of LA Scoring Strings I pan appropriately to the chart (e.g. first violins from -100 to -20, Cellos from +12.5 to +73, etc). Although this can be taken care of when bouncing tracks by bouncing a single stereo track as dual mono, this approach introduces a problem. If you’re applying EQ on that stereo pair, you will have to insert an EQ on both mono tracks or route the mono tracks into a stereo submix, and then apply the EQ on the submix. As a matter of fact, that seems like a good stopping point. Next time, we’ll take a look at EQing our orchestra to minimize competition between instruments for your ear’s attention. We’ll follow that up with a few words on reverb, and how to accurately re-create our orchestra’s cavernous environ. Well the practical solution is to divide the string ensemble in sections, which means 1st violins, 2nd violins, violas, cellos and basses, al individually. Check the chart for panning, because each section needs to have its space in the ensemble. (i.e 1st violins are panned from -100 to – 25), and they will all fit nicely into space. When it comes to layering, what I meant was to layer different string libraries like LASS and Cinematic Strings 2 and to make that LASS 1st violins play the same part as Cinematic Strings 1st Violins, but you need to record them individually, and not copy the midi data, because it will sound unnatural. You can use them all in Kontakt and route them to their individual outputs (see chapter 1 of this blog). Hi Ryan. I don’t understand how to layer two libraries. For example, you use the full string section from -100 up till +100, but how would I do this practically in Studio One? Where to insert this instruments in which tracks? As a second insert in the separate string patches? Good point about stereo vs. mono tracks-I’ll have to give that one a try! The missing dual pan in S1 is a pitty. So which binaural panning plugin do you use? I havent found a solution yet. No problem friend, glad to be of help!